As a celebration and showcase of the port city’s rich history of trade, manufacturing and research, the coastal metropolis of northern China, Tiānjīn (天津 – the delta of the Yellow River and literally meaning the “Ford of Heaven”), commissioned the international architectural studio of Bernard Tschumi to create a huge exhibition and conference space. 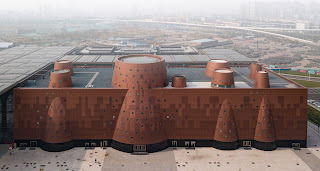 The perforated copper façade covered with portholes evokes the smokestacks of industry and will be the focal point of an urban revitalisation project that establishes a cultural centre in the Binhai New Area—just adjacent to the old town—and will be ready to receive its collections and first visitors in the autumn of this year. Learn more and see additional interior and exterior shots at Dezeen at the link above.